If you didn't know any better, you might think 1958's It! The Terror from Beyond Space is just another cheap B programmer designed to cash in on the science fiction and horror craze of the period. You wouldn't be totally wrong. Adding to your argument would be the over-the-top ? of its title (any title with an exclamation point in it is overselling itself), its drab black and white photography and the obviousness of its guy-in-a-rubber suit alien monster. Added together, these elements don't paint the picture of a movie that deserves a new Blu-ray release from Olive Films, much less a movie that we would still be talking about more than 50 years later. But a movie is more than just its parts, and cherry picking which elements of It! we want to take at face value ignores that it's a pretty cool movie and one for which, if nothing else, we must be grateful. 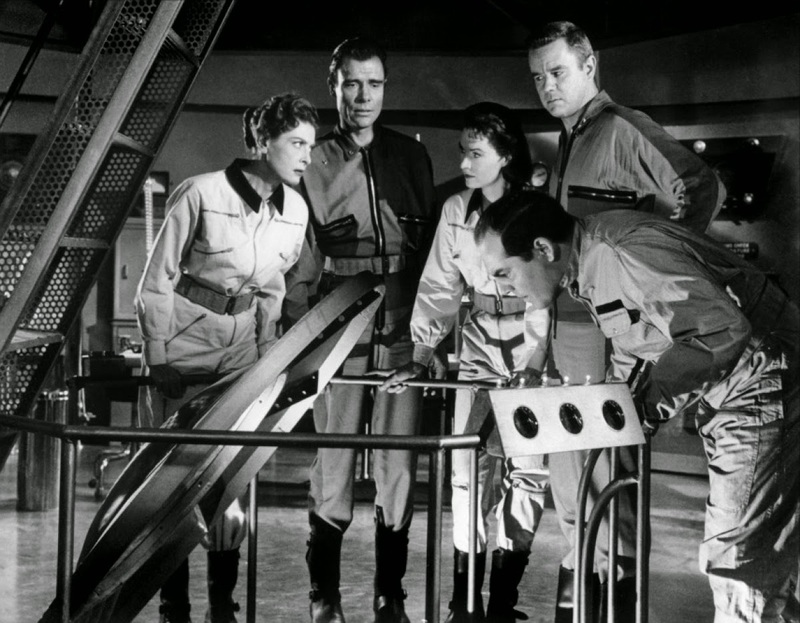 Taking place in the far off future of 1973, the movie opens with a rescue party being sent to Mars to recover the survivors of a previous mission, of which it is believed only Colonel Ed Carruthers (Marshall Thompson) survives. He is suspected of murdering everyone else in his crew but claims their deaths came at the hands of another life form. As the rescue crew discovers upon picking Carruthers up, he was telling the truth -- an alien (the titular "It") has gotten on board the ship as it returns to Earth and begins picking off the crew one by one. Nowadays, It! The Terror from Beyond Space is probably best known for its influence on Ridley Scott's 1979 masterpiece Alien, in which a crew aboard a spaceship is stalked and killed one by one by another life form on board. While there is no stylistic connection between the two -- Alien is all form, while It! 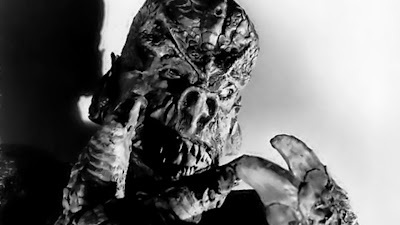 The Terror from Beyond Space is pretty crude -- a straight line can definitely be drawn from the '58 movie to the '79 one. Director Edward L. Cahn, who only made a handful of movies and none as well-known as this, doesn't avoid style completely; there are some cool and atmospheric shots in the movie, mostly involving the alien monster. The film's primary effectiveness, though, lies in its central idea -- that we are trapped on a ship with a monster who wants to kill us. We can't get away. Even avoiding it is difficult because quarters are fairly close. To make matters worse, failure to kill it before landing means setting the thing loose on Earth. None of this is handled as well as in Alien, but the implications of this nightmare scenario are still present. If the movie has one major issue, it's that it is paced all backwards -- most of the best stuff happens in the first half, leaving the second half something of a drag. Once the setup is out of the way and the alien is introduced, It! lets it rip for a little while. We get lots of the monster, lots of attacks. In the back half we get a lot of conversations about the monster and strategizing a plan on how to stop it, which is considerably less exciting. Were it informed by who these characters are, that would be a different story; unfortunately, the crew members are most indistinguishable from one another. That's another way that Alien improved on this one -- the characters were humans confronting a problem as humans and not similar-looking actors there to deliver exposition. While the 1080p high def transfer is less forgiving of the rubber alien mask than the previous MGM DVD release, Olive Films' Blu-ray of the movie looks very good (and, for the record, is correctly framed in 1.85:1 widescreen and not 1.37:1 full frame as the disc jacket states). The depth of contrast visible in the best black and white transfers isn't there, though that's not a fault of the transfer but rather the movie's photography, shot fast and cheap and looking like it. That's actually one of the things that I like about the movie -- there's a roughness to the edges that gives it an immediacy. Alien does slow and exquisitely beautiful; It! The Terror from Beyond Space feels glued together on the quick. As someone whose tastes tend to run towards B-level knockoffs versus their A-grade counterparts, I'd love to say that It! 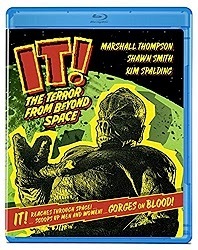 The Terror from Beyond Space stands out as such. Truth be told, though, the 1950s experienced such a tidal wave of movies like this that it's almost impossible to distinguish the "legitimate" productions from the also-rans. It's just one big pile of alien terror. It! stands out in part because of its influence on Alien and in part on its own merits. This is a solid genre throwback -- a drive-in movie forward thinking enough to set a horror movie on board a rocket ship. It's a good idea now. It was a good idea in 1979. In 1958, it seems practically revolutionary. I've got a lot of gaps in my film-watching history and pre-70s sci-fi is definitely one of them - this actually sounds pretty great and not just campy fun. As you said, it's hard to distinguish the legitimate productions from the also-rans - thanks for giving me one to start filling in that movie-hole. Any others off the top of your head?